We joined the stationary part of the demonstration and then after some blocking of the roundabout which the city refuses to allows pedestrians to cross and which is named after a nationalist figure we despise, we only marched one block with the common demonstration, instead deciding to picket the restaurant La Tomatina, where 3 women were to meet the boss later that evening to demand payments owed due to various violations of their rights and illegal deductions made from their salaries. This finally ended about midnight but with the restaurant offering less money than they were due and demanding they sign waivers of other claims, which they refused to do. 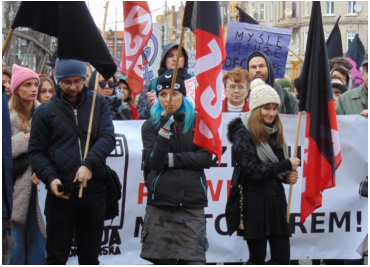 A week later, the comrades from ZSP in Wroclaw marched in the local Manifa which had a large libertarian presence, with local anarchists participating and also had a social presence, for example with participation of Tenants Action organization. In general the demonstration touched upon many social issues and comrades maintained a critical stance of the mainstream vision of feminism which equates this term with concepts of obtaining equal status is the power structures we aim to overthrow. Comrades from Wroclaw also sent during this time special solidarity greetings to WAS in Austria who were participating in and supporting a strike action. On March 8, in many countries of the world strike actions will take place in the framework of the International Women's Strike. Although we hear that the Women's Strike had its origins in Poland, unfortunately there are no such actions taking place in Poland. Women from other countries ask us what the strike is going to look like in Poland and it is a shame to admit that there won't be any. It is hard for us to explain the reasons for this situation, all the more so because in Poland such an action is even more necessary than in many of the places where such a strike is taking place. It is necessary not only because of the patriarchal approach towards women, but also because of the relentless attempts to control our reproductive rights and trying to impose the model of a heteronormative family on us all and parenthood as the only possible lifestyle. And it is especially necessary that in feminized professions, the salary if just too low. Also, transgender people find themselves in extremely precarious situations on the work market and constantly experience stress, harrassment and discrimination – and even physical violence. If we can refer to some feminist movement in Poland, we have to point out that for years this has a trans-class character. This fact, accompanied with a lack of consistent work to propagate the postulates of social feminism in a wider group of women has made it difficult to aim for a real women's strike – with work stopping in concrete workplaces – only any wider scale. Although we understand this situation and the social climate, we cannot give up. We can only organize such strikes in the future by building social and workers' organizations today – organizations which would fight against capitalist exploitation as well as patriarchy and cisheteronorms. Exploitation at work is one of the most common forms of violence experienced by working people. The coercion of slaving away for pennies and yet only being able to meet ones most basic needs is a form of violence, just like physical violence. The fruits of our labour serve mostly to enrich the owning classes. We want to create a society based on real equality – without divisions based on artificial gender criteria, without hierarchy, hate and power of one person over another. We believe that the strike is our weapon in our struggle, both in the workplace as well as outside it. If you agree with this, contact us.